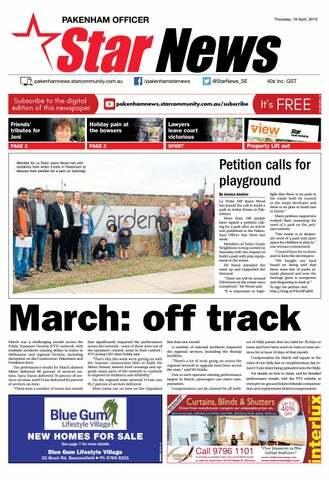 Member for La Trobe Jason Wood met with residents from Arden Estate in Pakenham to discuss their petition for a park on Saturday. to arrange a quotation from your local Blinds expert or visit our showroom: 22-24 Intrepid St., Berwick. Jeni Mathieson devoted almost all of her time to helping others through Pakenham's charity organisation 4Cs. of fun and she’s going to be greatly missed by everybody. “She just had so much energy. She would not finish at 5pm each night. She’d be working well into the night.” Another of Jeni’s co-workers and friends said she was impressed by Jeni’s “extremely strong faith”. “She had an amazing connection to God and she would speak to him as though he was standing beside her. That really had a big impact on me,” the friend said. “She was also quite open about it. That’s what she left with me. “She had a great sense of giving too. Whenever she saw something that needed to be done she just hopped in and did it.” A funeral will be held for Jeni on Thursday 18 April from 11am at the Turning Point Church, 1785 South Gippsland Highway, Cranbourne. Sadly, Pakenham woman Jeni Mathieson lost her battle with cancer last week. Her family and friends have reflected on her time with the 4Cs charity. ary where she had an epileptic seizure. She was told paramedics were transferring her to The Alfred hospital for a CAT scan. Then to her bewilderment, she was admitted as a compulsory patient into a psychiatric ward. “I don’t know if there was some sort of mistake Weeks later, she visited Narre Warren police station to apply for an intervention order. Upon checking her details, police officers grabbed her, patted her down in the car park and carted her back to Casey Hospital. There, medical staff started to shackle her to a bed and demanded she swallow psychiatric medication. She was told she had been avoiding her medication since released in the community. “’I’m not on any medication,’ I said. “It’s a very weird situation when your whole person and whole mind is being judged incorrectly. “I would rather be in a police cell.” A recent RMIT University review released this month found the IMHA service was doing a sterling job, but was under-resourced. The review is calling for a funding boost to expand the service to an opt-out model for all involuntary mental health patients. IMHA manager Helen Makregiorgos said the service was a “safeguard”. “You can be held in a locked ward and forced to receive medications, as well as other restrictions like limiting your communication with the world outside. “It’s a daunting prospect to face by yourself. “We support people to learn about their rights and have as much of a say as possible, so they don’t have to undergo unnecessary or unwanted treatment.” Dr Chris Maylea, who led the RMIT review, said several inpatients in Dandenong told how frightening the system could be, and how few the supports. “We identified that services often breached the Mental Health Act and that IMHA helps services to comply with the Act.” The IMHA was introduced by the State Government in 2015 at an annual cost of $2.3 million. Mental Health Minister Martin Foley said the Royal Commission into mental health would give answers to a system that needs repairing. “In the meantime, we will continue to support the Independent Mental Health Advocacy to make sure the views and voices of mental health patients are heard.” Meanwhile, Barbara is lodging a complaint with the Mental Health Complaints Commissioner. She is also submitting to the Royal Commission. Campervan stolen Police are appealing for help following the theft of a campervan in Berwick on Saturday 23 March. Police say the vehicle was locked but the keys were located and used to allegedly steal the vehicle. The vehicle has a manual transmission and solar panels on the roof with a beige interior. Police were only supplied an image showing only the front of the vehicle. Anyone with information is urged to contact Crime Stoppers on 1800 333 000 or make a report online at www.crimestoppersvic.gov. auand quote the incident number 190108989. Thirsty thieves take off with top-shelf liquor Police are appealing for help following the theft of four bottles of liquor from a store in Fountain Gate, Narre Warren on Saturday 13 April. Narre Warren police say the thieves entered First choice Liquor before selecting a litre bottle of Jim Beam and three one-litre bottles of Johnny Walker and leaving the store without paying. Police have released images of people believed to be aged in their twenties and of African appearance who may be able to assist their enquiries. Anyone with information is urged to contact Crime Stoppers on 1800 333 000 or make a report online at www.crimestoppersvic.gov. auand quote the incident number 190133991. Truck driver Mark Johnson with his son Mitchell who says fuel prices are ridiculous. would probably be 16 cents a litre, not much. "On road costs, daily road costs, fuel and maintenance is ridiculous," he said. According to Petrolspy.com on Monday 15 April BP Cranbourne South on FrankstonCranbourne Road and 7-Eleven in Cranbourne East on Ballarto Road had unleaded fuel priced at $152.9c a litre, while Woolworths Caltex Berwick on Clyde Road was $153.3c a litre, and Coles Express Narre Warren on Princes Highway, a $156.9c a litre. RACV manager of vehicle engineering Michael Case advised motorists to top up rather than fill up where possible. "The price cycle is a function of competition, driven by competing fuel stations attempting to undercut each other in order to sell more petrol," he said. "When this discounting reaches an unsustainable level where profit margins are very low or even running at a loss, the fuel price gets driven back up again by some of the retailers." Police wish to speak with these people. *Subject to your particular level of health cover, available and health fund rules. How long have you been involved in the theatre? My parents took me to the theatre when I was little and fell in love with it. I was in school musicals, helped back stage for local theatre since my early 20's. Been everything from props, to stage hand, choreographer to director. So I guess from a young age. What's the best thing about Star Search? Two things.... supporting and promoting local talent and raising money for cancer research. Billionaire Boy live on stage Thursday 18 April, 1pm and 3pm. Have you ever wondered what it would be like to have a billion dollars? David Walliams’ best-selling book comes to life on stage for kids - and their adults - to enjoy over the school holidays at Bunjil Place. Tickets are $12 and can be purchased from bunjilplace. com.au. The 1pm performance is a relaxed performance style that is accessible for a range of audience members including autistic audiences, and audience members with sensory or communication conditions, or learning disabilities. Easter Flicks – Rise of the Guardians Friday April 19, 2:30pm. The Easter bunny is bringin’ more than chocolate eggs these April school holidays! Get the fambam together and enjoy a free family flick - and a delicious marshmallow treat! Kite making fun Saturday April 20, 1pm-3pm. Drop into this fun craft-a-noon and have the kids make their own Easter inspired paper sock kite. Local businesses big and small are encouraged to enter, with inalists getting the chance to become the Casey Cardinia Business of the Year. This year’s awards will feature 10 categories, where winners will claim some excellent prizes, including a share of $12,000 in prize money and outstanding exposure. Applications for the Casey Cardinia Business Awards are now open! Free information session are available to businesses applying for the awards. Mother’s break-in shock By Brendan Rees A Berwick mother says she is feeling "massively shaken" after finding the contents of her car had been rummaged through. "There's a whole heap of things missing from my glove box," Jess-Louise Douglas said. She explained her partner had found her car door open as he was about to leave for work about 6.20am on Friday 12 April. "He told me straight away and I was up and out. I just don't know how I didn't hear it." She said her car, a 1998 Mitsubishi Lancer sedan was parked on the nature strip outside her home in Clendon Street. "There's a few things missing from the car but I've been told I'm not allowed to touch it until the police come over. "It was locked. My father actually reckons they may have tried to get my car started to try and steal it," she said. She was relieved to find her pram worth about $800 and baby seat still present. "Both of them would've woken me. If you try and take a baby seat out you make so much noise." A drink cooler was taken, and possibly some coins, as well as a new box of brake pads that had been opened. "I know I had bank details, as stupid as it was on me in my glove box. I don't know if they've gone or not. "It's a new estate in Berwick so I didn't expect this." She said adding to her heart ache was that fact she had been up the "whole night stressing" about her brother who had a kidney transplant the day before. "Bloody annoying...you go to work and you earn it." Narre Warren Police are investigating. Anyone with information is urged to contact Crime Stoppers on 1800 333 000 or submit a confidential report online at www. crimestoppersvic.com.au. Council to help local residents who have had their primary place of residence damaged by the recent bushfires, in their recovery process,” GERF president John Mitchell said. “We know that recovery for families and businesses in a long and demanding process. “The funding support provided by GERF is to provide some financial assistance to families/individuals whilst insurance and government claims are being processed.” Melbourne Food and Wine Festival was a generous supporter of this year’s GERD appeal by raising funds at several events. “While we’ve already provided support to many local families in need, the funds raised through this year’s appeal haven’t yet reached the payments GERF has made- so we’re encouraging members of the local community to donate where they can.” Donations can be made at any NAB branch across Australia, via cheque or Paypal, with further details available at gerf.org.au All donations made to GERF are tax deductable. NEW HOMES FOR SALE We have brand new home options available including one, two and three bed layouts and our “off the plan” choices allow you to customise and add your own personal touches to your new home. Australian owned family business since 1979. David W Bull Funeral Directors Provide understanding care and personal service. THUMBS UP THUMBS DOWN Thumbs Up! To the parents that stayed at home and looked after their little ones on holidays, no matter how big the personal sacrifice. Thumbs Down! To sitting on the Monash for twoplus hours, and having to pay for the privilege. To the grass cutters on Pound Rd Hampton Park, they only did a band aid job and didn’t cut the grass around the bottom of the trees or in between the trees. Thumbs Down! To all the customers who talk on their phone while going through the checkout at supermarkets. If the call is that important, don’t join the line until you have finished. Thumbs Up Thumbs Down is your chance to have your say. Malicious or defamatory submissions will not be accepted. All submissions must include a full name address and daytime phone number. Contributions over the phone will not be accepted. Contributors will not be identified. The Star News reserves the right to edit submissions. To submit a Thumbs Up Thumbs Down email to dailyeditor@starnewsgroup.com.au fax to 5945 0777 or post to P.O. Box 9 Pakenham 3810. Police believe this person who was captured on CCTV in the driveway of the victim's home may be able to assist their enquiries. One of the rooms ransacked by the intruders. 192533 Picture: STEWART CHAMBERS that time," he said. "I noticed when I pulled in that door was ajar connecting door to the house. "Looks like a four door Corolla in the footage. It's not clear but you can clearly see they've come from Scullin Street and walked straight across the road straight into my house," he said. Neighbour Shannon Marchant said she felt unsafe in her home: "We've ended up bolting our manhole up because anyone could just come in now; very scary." Anyone with information is urged to contact Crime Stoppers on 1800 333 000 or submit a confidential report online at www.crimestoppersvic.com.au. Cardiac care vital While there are some risks that can’t be changed - for example increasing age, being male, ethnic background (Indian sub-continent and Aboriginal and Torres Strait Islander) and family history - there are plenty of risk factors that can be mitigated: smoking,high cholesterol, high blood pressure, diabetes, being inactive, being overweight, unhealthy diet or depression/isolation. Fortunately for the people of Berwick and surrounding communities, St John of God Berwick Hospital offers a range of cardiac services and specialises in the management of patients who are experiencing symptoms associated with heart failure. Along with a cardiovascular interventional laboratory, which allows cardiologists to look inside a heart and enables them to diagnose and treat heart conditions, the hospital offers cardiac/high dependency care to patients who have experienced a cardiac event such as a heart attack. The 10-bed high acuity cardiac unit is part of the hospital’s Critical Care Unit which caters to patients who may need to be monitored very closely following major surgery, require the insertion of a stent, pacemaker or internal cardiac defibrillator, or for those who have unexpectedly become very ill. The hospital also provides in-patient and out-patient rehabilitation services which enables it to provide a holistic approach to cardiac care in this region. The hospital has also recently launched a rapid access Chest Pain Clinic which allows quick access to a cardiologist for patients suffering from non-active cardiac symptoms, within 1-2 weeks. A GP referral is required. For emergencies and active chest pain, please call 000. For more information on cardiac care, please contact St John of God Berwick Hospital on 8784 5000. Griffiths, can assist in the preparation of care plans, health assessments and immunisation. Kylie also has experience with weight management and programs for patients who are in need of some diet and exercise advice. The centre also has podiatrist Elmo from Tasman Podiatry who attends the practice fortnightly on a Saturday. Patients are bulk billed under a care plan for his services. Call 9792 4060 to book an appointment with Dr Ravi or Dr Priyanthi. Alternatively, book online on wwwdovetonmedicalcentre.com.au. The skin specialist Dr Navindra Madawala is currently working at Belgrave Hallam Road Medical Centre on weekends. Dr Navindra graduated from medical school in Sri Lanka and has been a General Practitioner in Australia for over 12 years. He has special interest in skin conditions and a Diploma in Dermatology and cosmetics. Dr Navindra runs a successful practice in Albury and has come to assist patients at Belgrave Hallm Road Medical Centre with mole checks, skins cancers and all skin procedures. Dr Navindra is available on a Saturday or Sunday for all patients' health needs. Please make an appointment with the friendly reception staff on 8842 4499. Heart disease claims the lives of thousands of Australians each year and that’s why the Heart Foundation is focusing on the importance of physical activity in reducing the prevalence and impact of the disease during its annual Heart Week being held from April 28-May 4. According to the Heart Foundation, cardiovascular disease is a major cause of death, killing one person every 12 minutes and accounting for nearly 30 per cent of all deaths in this country. Largely preventable, heart disease affects one in six Australians with more than one million people aged 30-65 at a high risk of having a heart attack or stroke - many of whom may not even know it. Knowing your individual risks is the first step in avoiding a heart attack or stroke and the best way to find out your overall risk is to see your doctor or health practitioner for a heart health check. WHAT’S ON Biggest morning tea It is on again! Get your friends, colleagues or community together over tea, treats and games. Help raise funds for much needed cancer research. Bring along your small change for our great raffles. Guest speaker: City of Casey Mayor, Cr Amanda Stapledon Book early to avoid disappointment. $10 per person. Thursday 23 May from 10am – 12pm at Balla Balla Community Centre, 65 BerwickCranbourne Rd, Cranbourne East. Ph. 5990 0900. · · Growing with Autism Conference Growing with Autism Conference is hosting its first Autism expo in Cranbourne focused on children, youth and young adults. This one day event will bring together exhibitors, NDIS, Guest speakers and entertainers Chloe Hayden- Princess Aspien and Tim Ellis Magician. The Lions Club will be providing sizzling sausages and vegie burgers as well. This event will cover people in the southeast, Peninsula and Gippsland. Saturday 11 May from 10am-4pm at the Cranbourne Public Hall. Corner of Clarendon and High Streets, Cranbourne. Tickets $15 adults and under 16 free. Dr Nic Cheah of Renew Dental Care. portantly, have made it much more painless to place as well. The team at Renew Dental Care in Pakenham are trained in the intricacies and surgical skills needed in the planning and placing of implants. Renew Dental Care is located at 3/106 Henry Rd Pakenham. Give them a call on 5945 3289 to see if dental implants are the right fit for you. The conductor of The Fenix Chorale Inc. is looking at retirement in the not so distant future and is seeking a deputy to start to assist at the moment and eventually take over.The choir sings four part works; anything from light opera to modern songs. The 30 members are senior citizens and practices are held at Woodlands Retirement Village, 72 Kangan Drive, Berwick in the auditorium, on the first, second and third Wednesday afternoons of the month from 2.30 - 3.45pm. Several concerts are held during the year at villages and churches in the local area. Please contact the Secretary, Margaret Haywood 9700 3973 or mhaywood.celebrant@ gmail.com if interested in the position which is unpaid or indeed to join the choir. Cranbourne Italian Seniors Club Meet every Monday at Cranbourne Public Hall to enjoy a morning playing cards, bingo and botchy and a cooked meal provided by the women of the Italian seniors club. Every third Monday of the month a meal is prepared by an authentic Italian chef and a dance is organised. On Monday April 29 the club will be celebrating its 2nd year anniversary with a hearty Italian feast.If you would like to attend please call Val Motta on 041466663 for more information. Casey Choir Casey Choir is performing at Choral@Montsalvat. This event is a full afternoon of music, from 12noon until 5pm with 13 choirs performing in 3 different venues, next door to each other. Move in and out of each venue as you please, to find the choir and the music that you most enjoy. Take the family, take a picnic or buy food there and if you have ever wanted to visit Monsalvat, then this is the day to do it. Casey Choir is performing at 1.00pm, please get there in time to support us. Tickets at the venue ticket-box or on-line at www.trybooking.com/BAOUK -Venue: Montsalvat, 7 Hillcrest Ave, Eltham. www.caseychoir.com.au Sunday 5 May from 1pm. Narre Warren Seniors Club If you are over 55, live in Casey, and don't go to the footy on Saturdays, then here's something you can do - come and play cards or darts with a friendly group of people at Narre Warren Seniors. Cards and darts are played on alternate Saturdays from 1pm to 3pm. &bull; 192-196 Centre Road, near the Narre Warren Railway Station. Phone 9704 0015 or 0426 736 467 for more information. Bounce into fitness with instructor Nidia at Brentwood Park Neighbourhood House. &bull; Thursdays from 7pm to 8pm at Brentwood Park Neighbourhood House, 21a Bemersyde Drive, Berwick. $10 per session. Bookings 9702 1218 or admin@bpnh.org.au. Easter services Tennebrae Service (Service of the Shadow) Holy Thursday, 18 April at 7.30pm at St Andrew's Berwick 105 High St, Berwick. Good Friday 19 April, combined service at 10am. Easter Sunday 21 April, worship at 9am - all ages. Blended Traditional Service at 10:30am. Tuesday playgroup Your child can socialise and make great friends at a small and fun Tuesday playgroup. The group is supervised and facilitated by an experienced playgroup leader, with craft activities, songs, story-time and outdoor play. For children up to four years old. &bull;Oakgrove Community Centre, 89-101 Oakgrove Drive, Narre Warren South, Tuesdays, 9.30-11.30am. Bookings on 9704 2781. By Brendan Rees Narre Warren North fire brigade has achieved a milestone of 75 years serving its community. It was 11 February 1945 when residents banded together to form the brigade with donations exceeding 20 pounds at its first meeting. Members past and presented gathered on Saturday 6 April for a ceremony where captain Mark Dobrich and past captain Ivan Smith cut a celebratory cake to mark the occasion. Commander Arthur Haynes addressed attendees saying a lot had changed but the volunteers’ passion in serving the community had lived on. “In the early 1960s the brigade started looking for a site, as we had equipment in several farms around the district,” he said. “The fire truck needed to be more accessible, also the siren was located on private property.” “Len Sonogon donated half an acre of land to the brigade in 1963. The brigade some years later built the first stage of the fire station with the assistance of a small contribution from CFA. “The major fundraising activity was an annual bonfire night, five dollars all you can eat and drink. “After the first year, the system had to change due to the amount of alcohol being consumed. All the profits were being drunk,” Mr Haynes said. He said the brigade purchased their own “old brick” truck in 1972 which had a 1000 gallon tank fitted with a high capacity pump and a large German monitor. “Operationally the brigade has experienced a number of major fires within the boundaries of Narre Warren North,” he said. This included a Churchill Park fire in 1972, and a man who decided to burn a bush around the end of King Road in Harkaway in 1975, he said. The brigade also assisted in the Black Saturday fire 10 years ago where seven homes were destroyed and several others severely damaged in Narre Warren South. Or, subscribe NOW for your FREE Digital edition! AVIVA REINVENTS RETIREMENT IN OFFICER AVIVA Communities has commenced work on what will be a ground breaking residential community for people over 50 at Officer. Managing Director of Aviva Communities Todd Strathdee said the $55million project is all about reinventing retirement and creating a community that is more suited to a young-spirited retiree. “The innovative design of the community and what we are able to offer our homeowners is very different to other options in the market,“ Todd said. Designed by award winning Wolveridge Architects, the homes and clubhouse reflect modern housing styles that are based on the history Officer and embody design practices that optimise liveability for homeowners. At Aviva Officer we are challenging the traditional approach to retirement living Modern energy-efficient homes, inspiring lifestyle facilities and providing a safe, secure community are of course central. However, what is different is how we are genuinely helping you meet the very real and everyday demands of retirement – with our mission to provide homeowners with more choice, financial control and certainty in their future. Oficer’s newest land opportunity is in a class of its own. While best endeavours have been used to provide information in this advertisement that is true and accurate, Heathield Scholar’s Row, its consultants, agents and related entities accept no responsibility and disclaim all liability in respect to any errors or inaccuracies it may contain. Prospective purchasers should make their own enquiries to verify the information contained herein. Shop 8/7 Kilvington Drive, EMERALD Memphis Hair Design has been operating in Emerald for 3 decades & is being offered for sale, presenting an opportunity for an owner operator to step in & bene t from the established client base and great cash ow. All equipment & furniture included, the owner will be exible with handover to ensure a smooth transition. Spectacular opportunity to increase your business with beauty services in the existing facilities available. You are not limited to a hairdressing salon, these premises would be ideal for other business purposes. 120 CoRINEllA RoAd CoRINEllA Neat as a pin ‘Queenslander’ style home with wrap around veranda on just over an acre. The home full of character includes 3 dbl size bedrooms, Master with WIR & ensuite. Main bathroom with vanity, shower & bath. Kitchen with stainless steel appliances & spacious family lounge. Solid fuel heating and 2 x RC Split systems provide comfort year round. A private property with distant Bay & French Island views, small pond, asphalt driveway, 5 car undercover parking excellent colourbond shedding, mains & tank water connected and more! BRAND NEW AND READY FOR YOU! HERE I present to you an immaculate five bedroom family home finished to perfection. This stylish, modern and sophisticated home located in prestigious Hartleigh Estate in Clyde is the perfect forever home. Situated on a generous 392sq block this property boasts so much than just its location. Features include five great size bedrooms (including a guest room downstairs with a full ensuite and walk in robe). All other bedrooms are upstairs with built in robes and the master has its own walk-in robe and ensuite. The property also boasts four spacious living rooms (great for separation and entertaining those big parties) and one can also be used as a study. There is also a huge kitchen with stainless steel appliances throughout, stone bench tops, great storage and a massive walk-in pantry to be any budding chefâ&#x20AC;&#x2122;s dream. Also included is evaporative cooling and ducted heating as well as a double lock up garage with internal access. The property is fully landscaped throughout and has high ceilings. This beautifully presented home is built to the highest standards and quality finishes. It is within easy walking distance to all needed amenities, with schools, shops, bus stops and parks nearby. â&#x2014;? THE RESERVE ON RIX Reserve On Rix is more than just a home - itâ&#x20AC;&#x2122;s a neighborhood, a community & a family that comes with top class amenities. Reserve on Rix offers a boutique opportunity to live in an area that will fulfill all your family wishes. Officer has an exciting and vibrant hub of activity in its town centre with a buzzing town square, shops, restaurants, community centres and parklands. Approximately 40 minutes from Melbourne CBD. Public transport will get you to surrounding suburbs and centres, and into the city. The nearby Arena shopping centre allows you to live and shop local in Officer. Reserve on Rix offers you land lots sized from 205m2 to 375m2. Its your time to reserve a piece of the reserve. "do the best we can." "This Mother's Day Classic my kids asked what I wanted for mother's day and I said they're doing it with me," Jodi added. Lifestyle Communities hopes to achieve its single largest group to ever walk with 600 attendees at the Mother's Day Classic which will be held on Sunday 12 May at the Alexandra Gardens, Melbourne. We just keep getting MEGA. health care system for the entire community. According to government figures, 45 per cent of metropolitan emergency department presentations are non-urgent. Tiny Hearts has also compiled statistics from participants, illustrating the importance of teaching the critical first aid skills. After the course, 98 per cent of parents said they felt more confident to act effectively in an emergency. Almost 50 per cent reported that they had used their acquired infant and child first aid knowledge within six months of undertaking the course. Narre Warren's Shelby Cooke, who performed CPR on her choking two-year-old daughter while paramedics rushed to their home, stressed the importance of first aid training. She believes that had she not received the course through her workplace, her daughter may have suffocated. "I still owe everything to having those skills," she said. "The more people that are equipped with them, the less tragedies we're going to see with children, babies and toddlers. "It's such a frightening thing to go through - so you need to be prepared." The free sessions will be held across the region, including at Beaconhills College, in Pakenham. Topics covered will include choking, fevers, convulsions, burns, drowning, bleeding, caring for an unconscious person, bites and stings and head injuries. Parents or caregivers interested in undertaking the free training can sign up by heading to: www.tinyheartsfirstaid.com/fundedcourse. Specialising in new homes, fixing, frames, renovations, form work, extensions, retaining walls, pergolas and decking. Speak to our classiďŹ ed team and ďŹ nd out how easy it is to advertise. Start building your brand today and be seen every week in Network ClassiďŹ eds Trades and Services. From plumbers to pest control, carpet cleaning to building services, dry cleaning to computer repairs, lawn mowing and more, Network ClassiďŹ eds has been connecting local businesses with the local community with our Trades and Services each week. Pakenham Electricians Call Us Today For our FAST FRIENDLY SERVICE! Hi, Iâ&#x20AC;&#x2122;m Jason. Is your . . . Call Us Today... FOR OUR FAST & FRIENDLY SERVICE! Award nomination - Vic 2014, 2015 and 2016. Pest Manager of the Year. General Classifieds section of Network Classifieds. Real Estate V To Share NARRE WARREN, luxury accommodation starting from $160pp per week which includes bills. Bond required. Suit students, singles or couples. Close to bus, train and shops. 0429 022 889. FREE CLEAN FILL, Wanted clean fill site, south eastern area. Dams, gullies, paddocks, filled and levelled, no charge. Phone: 0418 356 583. By Kyra Gillespie have been Members of Cardinia Men’s Shed truck for hard at work, building a small fire the CFA. at CFA The bright little truck will be used around open days and recruitment drives the Cardinia catchment. Lisa The craftsmen met with the CFA’s at PakenHicks for an official handover on Thursham’s Living and Learning Centre day 28 March. it will “They did such a wonderful job; to athelp with volunteering, something we are dotract the families and kids when Hicks said. ing recruitment campaigns,“ Ms of $300 “We were able to secure a grant project. for the Men’s Shed to complete the in myThursday, 4 April, 2019 “I went down there with a vision to fit had it mind and they made it happen; enough in the back of the Ranger, be light the kids. for two people to carry and safe for and “It has working lights, a little ladder a fire hose. It’s amazing.“ CFA’s The grant was secured through the South East Volunteer Sustainability Team, Region. denong and Cheltenham purcharges after leading police on a dangerous PAGE carrying a3firesuit across the South East while arm and under the influence of drugs. mances. $259 Grade 6 REG teacher Melissa Butcher said the SAVE day was hailed as $130 a success with the school recognising their cultural diversity with a Pakenham Optical Multicultural 2277 Big Day Out on Monday 25 Ph: 03 5941 120 Main Street, Pakenham VIC 3810 Address: March. Eden Rise Optical "Students rotated through some amazPh: 03 8786 8088 & Clyde Rds, by their class 9, Cnr O’shea provided Shopactivities Address:ing teach3806in multi-age groups," she Berwick ers said. Casey Optometrist Fun activities included a Chinese shadPh: 03 9705 2058 ow 105 Casey Central,400 Cranbourne Rd, class, African and calligraphy Address: Shoppuppetry 3805 and Scottish South VICGreek weaving, Narre Warren dancing, Japanese origami, Egyptian masks, Maori Poi balls, Venetian masks, Spanish pinatas, IndiPicture: STEWART CHAMBERS an henna hand designs, robotics and more. Now the kids are back at school it’s time to get that dental check! 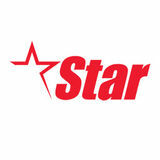 Star News Group seeks an enthusiastic sales executive to work across our print, digital, social and online platforms. Star News Group is an independently owned company which prides itself on its long history of community experience but also its investment in the future. The successful applicant will need to possess good people skills to enable them to meet with local businesses to sell solutions through our advertising platforms to help promote their business. Sales skills/experience: ฀ ฀ ฀ ฀ ฀ to create new ones ฀ ฀ ฀ ฀ ฀ ฀ ฀ ฀ ฀ ฀ ฀ ฀ ฀ ฀ ฀ ฀ ฀ ฀ ฀ ฀ ฀ ฀ ฀ ฀ ฀ ฀ ฀ ฀ ฀ ฀ ฀ ฀ ฀ ฀ ฀ ฀ ฀ ฀ ฀ provide an allowance. MALTALIER PUPPIES x4, 9 weeks old, 1 female, microchip, 956000010837200/7118/6976 /7097. Call 0400 687 223 for price. Poultry Catchers For live poultry transport. Casual position, 5-6 days p/w, with the option to go full time. Early starts, heavy work, may be required to work some weekends. Must have drivers licence. Only persons with a stable work history need apply. Please Call 5942 9277. Pakenham. TRUCK DRIVER Local, country and interstate work. Phone Russell 0409 023 056 or 0408 515 225. Morning newspaper delivery driver required. Own car. Good pay. Phone 9707 1311. NARRE WARREN NORTH 169 Belgrave Hallam Road, Fri 19th, Sat 20, Sun 21st and Mon 22nd April, 8am-5pm. Fundraiser for KKCF for Sri Lanka. Make Extra $$$ in your spare time to support your income or for fitness, by becoming a reliable and enthusiastic independent distributor delivering local newspapers and leaflets in your local neighbourhood. With experience in Heavy Structural Steel required for immediate start. Pakenham area. HOLDEN ASTRA 2003 Reg RMZ472 One Female owner from new. With full service history from new. This low 150000klm well kept little economical car is in excellent con would be a great 1st car or Runabout. Leather int, Automatic, Full Elect. Comes with RWC and Rego $4250. Phone Allan 0407 505 040. HOLDEN Commodore VY Executive, 2004, auto, 153,000kms, new tyres, VGC, reg until 05/ 2019, UXJ-251. $3,000. Call 0429 411 354. Real Estate section of Network Classifieds. Employment section of Network Classifieds. Lawyers own the court The lawyers at Duffy & Simon in Pakenham brought it all to court, playing off for the Pakenham Netball Association senior mixed Division 2 final against local team COBS recently at Cardinia Life. The Duffy & Simon mixed netball team was made up of players from the local law firm, with many having a background in the local West Gippsland Football Netball Competition. Duffy & Simon partner Sandy Keysers, from Nar Nar Goon Football Netball Club, added her skills on the court by playing a dangerous wing attack in the final. Receptionist Grace Cunningham was awarded best on court honours in the grand final and talked about the positives of playing a sport together. “The Duffy & Simon netball team has attributed to the positive workplace culture and team environment within the firm,” she said. The first half of the game was a close affair, but Duffy & Simon managed to get a break in the third quarter by creating many turnovers in the defensive end and mid-court. This saw goalers Grace Cunningham and Robert Hall convert with great accuracy. The local law firm had a great turn out from family, friends and co-workers with over 35 people attending to watch the victory on the night. Captain Maggie White said the win was a testament to the culture the side had developed and praised her teammates on their performance. “We knew we wanted it and I wanted to see it from them and they definitely delivered,” she said. Thanks to a top performance by the lawyers on the night, Duffy & Simon secured its first Pakenham Netball Association Division 2 premiership over the COBS, 25-14. Duffy & Simon’s starting line-up included: Robert Hall (GS), Grace Cunningham (Nar Nar Goon Netball Club, GA), Sandy Keysers (Nar Nar Goon Netball Club, WA), Maggie White (Nar Nar Goon Netball Club, C), Chris Luxford (ROC Netball Club, WD), Olivia Hunt (Bunyip Netball Club, GD), and Bryce Grimshaw (Trafalgar Footy Club, GK). Duffy & Simon Lawyers proved their talents on the netball court. Warriors get the job done at Big V level By Hayley Wildes It was another strong weekend of Big V basketball for the Pakenham Warriors, with three teams chalking up wins. It wasn't necessarily pretty, but when the game was there to be won, the Division 2 men rose to the occasion and took care of business against Wallan at home on Sunday afternoon. With the Panthers hitting their shots from deep, the Warriors struggled to keep up and just under halfway through the third quarter trailed by eight points, 53-45. Josh Dow was doing his best to keep Pakenham in the contest and when he completed a massive and-1 with four minutes to play in the third quarter, the Warriors had suddenly evened up the contest, 53-53. It was Dow and Daniel Steen that helped get Pakenham on top with clutch plays down the stretch and when Steen grabbed a steal and finished on the other end, the game was all but over, with Pakenham leading 78-70. The Warriors ran out 82-73 winners, finishing the game on a 37-20 run in the final 15 minutes, with Josh Dow (23 points, 9 rebounds and 3 assists), Brad Bridgewater (15 points and 10 rebounds), Daniel Steen (13 points, 7 rebounds and 7 assists) and John Creighton (16 points and 11 rebounds) producing terrific performances. The win sees Pakenham (6-0) remain undefeated and sit second on the ladder. Meanwhile, the Division 2 women took on Sherbrooke on the road on Saturday night and came away with a hard-fought win. With both struggling from deep, it was Pakenham's dominance on the boards and ability to convert second chance opportunities that was the difference. Young gun Ellie Coutts (18 points, 12 rebounds, 7 assists, 4 steals and 2 blocks) and Steph Pal (15 points, 8 rebounds, 4 steals and 3 assists) led the way as the Warriors claimed a 66-61 win to improve to 4-1 on the season and sit second on the ladder. The Youth League 2 men made light work of Keysborough at home on Sunday, winning 97-80. Pakenham's willingness to share the ball was key to the win as they dished out 24 assists, compared to just 10 from the Cougars. Ned Weideman (24 points and 14 rebounds) and Lee Belton (19 points and 4 assists) led the Warriors home. The Warriors (5-0) remain undefeated and sit on top of the ladder. The Youth League 2 women were unable to get over the line against Sherbrooke on Saturday night, falling just short of victory, 70-65. Jasmine Ralls (15 points and 5 rebounds) and Sarah Thomson (11 rebounds and 10 points) did all they could for Pakenham but it wasn't enough. The Warriors (2-4) sit ninth. There's no Big V action this week, with teams returning to the court the following weekend. Doveton SC drew 3-3 with Malvern City at Waratah Reserve, despite being down at halftime. Disappointingly for the Doves, they couldn't capitalize after scoring a goal in the opening minutes, going into the main break with a 2-1 deficit. A penalty gave City the best possible start to the second half and a 3-1 lead to go with it, but the Doves found the back of the net only minutes later before Josh Frame found the equaliser in the 89th minute. and Emma Michie. Team 11 has informed members of the New Leagues Working Group and the National Second Division Working Group of its intention to continue to lobby for an A-League/W-League licence and learn more about plans for the creation of a National Second Division. All involved with the Team 11 bid were overwhelmed by the outpouring of support and disappointment from members of the southeast Victorian community in the wake of Football Federation Australia’s decision to award A-League licences elsewhere in December. This support - coupled with the bid’s unwavering belief that this booming, multicultural population of more than 1.7 million is capable of growing what could become Australia’s biggest football club - was crucial in convincing all involved to keep the bid going. Team 11 will also continue to be an unashamed advocate for infrastructure development and activity in the south-east as the region continues to be overlooked in favour of others by key decision-makers. Further announcements, including the undertaking of a community-led rebranding process, will be made in due course. ron Hayden and Nicholas Rippon were best in a tough day at the office. Casey has a bye in Round 3 and will return to action in Round 4 in what should be a great contest when they take on Richmond at Casey Fields from 2pm on Saturday, 27 April. QUIZ NUMBER 1656 1. FOR which English soccer team does Aussie goalkeeper Matt Ryan play? 2. WHICH great Australian sporting all-rounder competed in three sports swimming, diving and boxing - at the 1908 Olympics? 3. WHO was ‘The General’ of Australian basketball? 4. WHAT medal is awarded to the best player in the AFL grand final every year? 5. IN golf, how many shots above par is a bogey? 6. WHICH horse did Mick Dittman ride to victory in the 1983 Melbourne Cup? 7. WHO was the last amateur to win the Australian Open golf title? 8. WHICH identical twins were key figures in English cricket in the 1940s and 1950s? 9. WHICH two great Olympians provided the basis for the movie ‘Chariots of Fire’? 10. WHICH Australian squash player won the first World Open Men’s title in 1976? 11. WHICH three countries did Australia play when it qualified for the 1974 World Cup soccer finals? 12. WHICH American tennis player was dubbed ‘the unmade bed’ early in his career by critics because of his untidy appearance? 13. IN what year did the People’s Republic of China first compete at the Olympic Games? 14. WHICH major golf title did Australian Wayne Grady capture in 1990? 15. WHY were tie breakers introduced in tennis? 16. WHO trained Olympic champion Betty Cuthbert for much of her career? 17. WHICH renowned ABC sports radio commentator was suspended for a racist remark in 2013? 18. WHICH disgraced South African cricket captain died in a plane crash? 19. IN which jet powered boat did Ken Warby set his world water-speed record in 1978? 20. HOW many points is a snooker player penalised if he sinks the white ball while shooting at the blue ball? Price correct at publication date. $445K AS A BO K U OUR T OFFE R! Design includes: • 2 bedrooms plus study • 2 bathrooms • Brick & render construction • Double garage • Paved north facing alfresco No deposit required to reserve your villa. Nothing to sign until you sell your house. Price correct at publication date. Freecall 1800 770 222 Information Request I wish to receive (Please tick): A phone call from an RCA Villages representative. Cardinia Waters Village Brochure. Main Street Village Pakenham Brochure.